In 2005, thirty-five Swedish households were asked to keep a diary about food purchasing and usage habits. 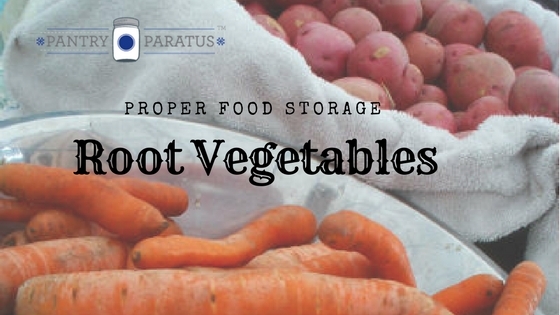 44.1% of all root vegetables were wasted after storage. * This was second only to dairy products. Based on the number of potato eyes staring at me from my food storage, I would guess that Americans are experiencing the same results. Temperature is not the only factor, and not all root vegetables need the same thing. Do you know how to properly store root vegetables? Whenever I teach dehydrating class, there is something I say about four times an hour: “You’ll only get out what you put in.” If you’re starting with root vegetables knicked from the garden spade, limp, or diseased, you will have food waste. If you have vegetables or fruits that are cut or bruised in some way, you need to process those immediately. 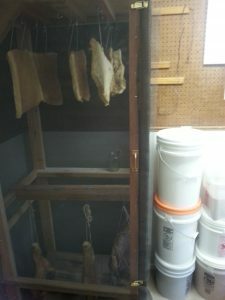 Make fruit leathers or fruit leathers instead of attempting food storage. Root cellars are a fantastic way to go; I used to have one and am still mourning its loss upon our move. But don’t be fooled; they don’t solve all of your problems, as rodents and insects, air too dry or too humid, or light can still ruin your harvest. Root cellars come in all shapes and sizes and need not be elaborate, so consider researching them to see if it could be an option for you in some form. A hole in the garden with a cooler might even do the trick for you. Of course, once you open it, you’ll need to remove everything from it, and that might not be so easy to do if you live in the frozen tundra. Most root vegetables are best left in the ground, with some things (like parsnips) getting sweeter as those sugars freeze. Let the great outdoors serve as your natural refrigeration. If your ground freezes and you live where snowshoes are fashionable footwear (like our home state of Montana), then leave only what you will want to harvest in the Spring. Pull out what you will need through the winter. 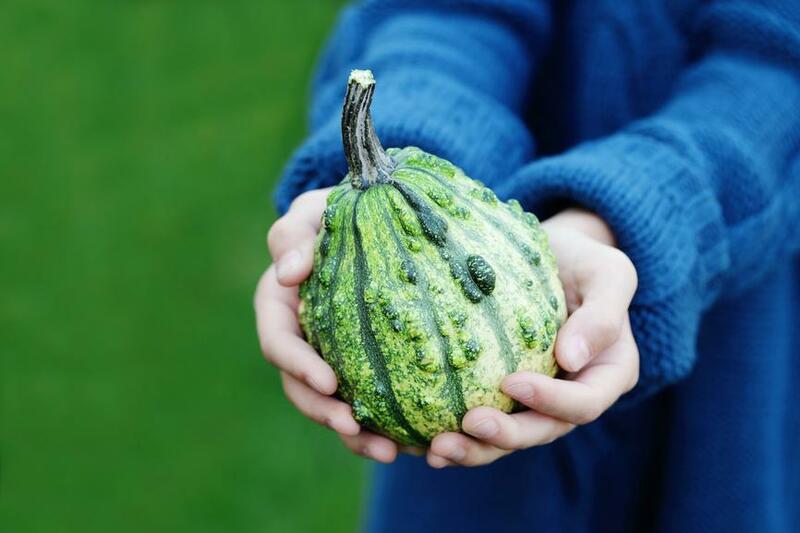 When you do harvest them, be sure to only dig them up when the soil is dry; you can brush away snow, but if you have had a thaw, you will need to wait until the soil has dried out. Potatoes, parsnips, carrots, beets, leeks, turnips, and many hardy leafy greens (like kale) are best in the ground. Root vegetables should be put to bed; cover them with straw or other bedding. Also keep in mind the risk you might be taking with wildlife; Brussels sprouts also overwinter well, but the deer will get to them if not protected. You will hear a lot of differing opinions about the right temperature and humidity. The best thing to understand is that not every vegetable thrives in the same conditions. For instance, onions, potatoes, pumpkins and squash, and garlic do best in extremely dry locations, but nearly everything else needs a high humidity content (with airflow, to avoid mold). If you are keeping your vegetables in the basement laundry room, you might get enough humidity in there already, but the goal is around 90% humidity. ! Just keep checking on your storage to see if water droplets are forming, an indication that it’s too humid. Keep rotating the foods so that they do not develop mold and have proper ventilation. Keep a thermometer near your food storage. You might be surprised at the actual temperature of the space, regardless of what your home thermostat registers; everything has a “microclimate!” Just like there are some root vegetables that like a dry climate instead of a wet one, there are some root vegetables that like a warm climate instead of a cool one. Sweet potatoes, tomatoes, pumpkins and squash, and even potatoes do not like to be too cold. This is a good time to mention apples: although apples can also go into your food storage, it is best to keep them separate from your root vegetables. They can emit gases that speed up the decay process in other foods. Some other foods really should be kept apart, such as your onions and potatoes. Now, I will tell you that I’ve broken this rule a time or two, so do what you will, but supposedly it speeds up sprouting. Always keep the location perfectly dark. If you use the space for other purposes, use burlap bags or cardboard boxes. It’s ideal to keep the vegetable from resting against others, so many people fill the boxes with sawdust, etc. That’s because “one bad apple spoils the bunch” and it’s a way to protect them from the gases emitted by the others. You could, alternatively, separate layers with packing paper. Only use food grade containers. If you build a bin, use untreated wood. Here is a quick list of how different vegetables like to be treated. Beets: They should be stored dirty and with their tops. The longer they store, the more they turn bitter. They do best refrigerated and with some moisture, but don’t suffocate them! Make sure they are not bagged, or they will mold. A crisper drawer works well. If you are concerned they will be too dry, wrap them in a moist paper towel. Cabbages: Increase the nutritional value by making homemade sauerkraut, nothing needed but sea salt, shredded cabbage, and a jar or crock. Cabbage heads will also store, best if hung instead of packed in a box. Check for insects under the top leaves or they’ll be ravaged when you want them. Cool, dry, dark environment is best. Cabbage will lose some of it’s vitamin C content if kept at room temperature, so cold is best! Carrots: medium storage life. Cut tops off (use those in a soup or smoothie immediately). Cover and store in a cool, dark location. Garlic: Beautiful braided, but not necessary. Leave them out in the sun for a day, do not wash. Store in a dry, dark location. Garlic also does well in a paper bag. Onion: Leave out in the sun for a day to “cure it” (and ensure dryness). Store in a dark, dry location. And if for some reason one sprouts, plant it in a pot and put it in your windowsill for a quick snip of chives. Keep them away from the potatoes. Parsnips: Remove leaves, do not wash. Short storage life (about a month). Keep cool . Potatoes: they can stay in the ground all winter, or you can harvest. Long storage life. Best left with dirt on them. Set out for a day to ensure they are completely dry, then pack in small batches in paper bags with a few holes punched into it, covered. Store in darkness. Never refrigerate. Consider dehydrating potatoes. 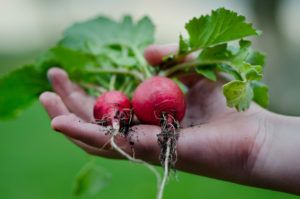 Radishes: Remove tops and store without cleaning first. Rutabaga: Will store best if smooth and not cut or nicked in any way. Will stay fresh for about a week in the refrigerator. Consider dehydrating and powdering. Turnips: They should be stored dirty and with their tops. The longer they store, the more they turn bitter. Squash: Squash does best at room temperature, not in cold environments, for overwintering. Sweet Potatoes: Store in a paper or burlap bag in a dark, place at just cooler than room temperature. *Sonesson, U., Anteson, F., Davis, J., & Sjödén, P.-O. (2005). Home Transport and Wastage: Environmentally Relevant Household Activities in the Life Cycle of Food. Ambio; Stockholm, 34(4/5), 371–5.